Relax and enjoy the holidays in a nice place like Vodice. The city located by the sea in a wide bay is known for its lively and rich tourist offer, where everybody finds something that will make his stay special. Vodice offers you the unique beauty of Dalmatia. In the quiet part of the old town with narrow streets you can find cozy wine cellars and small restaurants. Looking at the boats lightly swinging in the dock, while drinking a morning coffee, feel the pulse of this coastal town. The beautiful natural beaches, where the livelihood starts and ends with the sunrise, the warm sun rays, the blue waters of the Adriatic Sea, murmur waves, the smell of pine trees and the song of the crickets, will relax your body and soul. It takes so little for a dream vacation in the embrace of nature, so come, we are waiting for you. During pleasant evening walks, where you are accompanied by a wide range of flavorful aromatic specialties, drinks, various snacks and ice cream, indulge yourself and enjoy delicacies. In the company of warm hosts you will feel at home. 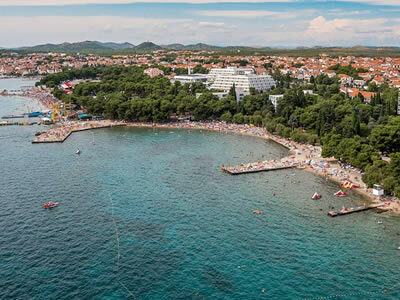 Vodice is famous for its liveliness, entertainment never misses. Everyone can find something to its liking - traditional amenities; folk evenings, concerts, festivals, street performances, Dalmatian festivals ... The terrace of the various cafe bars and patisseries is always full, nearby shops and boutiques invite everyone to buy, nevermind young or old. Outdoor disco clubs attract those who want to have fun and dance until dawn. With us you will spend your vacation in comfortable, fresh and clean apartments, on a quiet location. Apartments are located on the first floor and are suitable for stay of four (+1) person. Each apartment has two bedrooms, a bathroom, a fully equipped kitchen, a living room with an extra bed and a terrace. Parking is provided in front of the house (1 car / apartment), and there is also an outdoor grill. You can see the photos in the gallery. 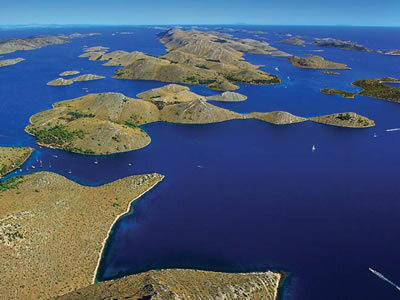 For active vacation lovers, various sports and recreational activities are available (diving, fishing - Big Game Fishing, sailing, SUP, water surfing, kayaking, water skiing, sailing, boat rent, pedal boats, diving, jet-ski, waterslide, cycling, tennis, hiking, one-day lunch excursions that include both lunch and swimming on the Kornati islands). Be curious and explore the surrounding natural sights such as the Krka National Park with its beautiful waterfalls, the Kornati National Park - an archipelago consisting of islands and rocks, which is a paradise for nautics and divers or Vrana Lake. Vodice is proud of its history and customs, what you will be convinced of if you visit numerous cultural and historical monuments, that tell stories about the past. 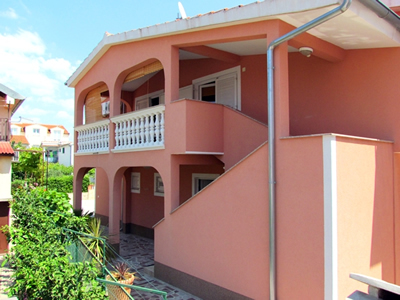 We rent apartments in Vodice, Croatia. Spend your vacation in fresh, clean and individually decorated rooms. The distance from the sea is 150 meters, and 800 meters from the center of the city. Apartments are air-conditioned and the use of air conditioning is free of charge. Residence tax is included in the price of the stay. Beaches are maintained – most of the beaches are made of concrete, and some beaches are pebbly, there are several smaller beach restaurants and water slide (hotel beach, camping – free entry). The beach is 150 m away from the apartment (4 minutes walk). Parking is provided in front of the house (1 car / apartment), and there is also an outdoor grill. The shop is 50 meters away. Vodice is a recognizable tourist destination with a diverse offer for young people and for the elderly. There are numerous natural sights (Kornati, Krka river waterfalls, Vransko lake), which can be seen in your own arrangement or organized. 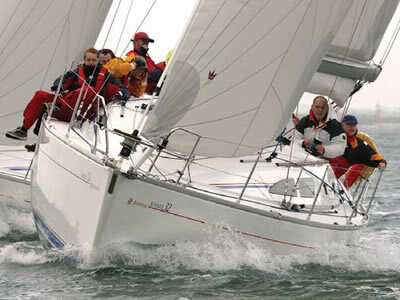 There are many opportunities for various sports activities (tennis, biking, windsurfing, water skiing, fishing …). The city is lively, has many catering facilities, a shopping mall … it even has a quiet corner. If you are interested in any information, please write in your inquiry.